Wealth and Antisocial Behavior: Reverse Causality? The tone of the first wave of commentary, as far as I can tell, is that we knew it all along—rich people are nasty. I would like to put in a word, however, for the other direction of causality, that dishonesty and putting one’s own interests ahead of others are conducive to wealth. I certainly don’t mean this deterministically; there are lots of stone-broke cheats and chiselers out there. Nevertheless, at many key moments of life people face a choice, whether to shade a bit and advance their own career, or remain honest and end up back in the pack. Do you take credit for someone else’s work in order to get a promotion? Do you leave out some information that would reduce the likelihood of a sale that would make you a tidy profit? And if you find yourself in a zero-sum situation where your gain is someone else’s loss (or more gain for you means less gain for them), do you push your advantage as hard as you can? The reason I bring this up is because there is a constant background murmur in our society that says that greater wealth has to be a reward for more talent, more effort or more contribution to society. When Steve Jobs died, he was a poster child for this view. Yeah, he was something of a jerk, but he gave us all those great gadgets, and that’s why he was so rich. Could it be, however, that among all those whose intelligence, creativity and obsessive toil drives progress, what separates the Steve Jobs from the Unknown Nerd is the bundle of personal traits that add up to claiming for oneself alone the contribution of everyone else? There are a lot of people who could never imagine raking in billions while those who do the physical work in China are driven to, or past, the brink of suicide. They won’t get to be CEO. Nor would the people taking in the super-bonuses at Citi, G-S, BoA and the rest be where they are if they put as much energy into making sure mortgage borrowers were treated legally and fairly as they do into squeezing a little more profit into the kitty. Maybe the reason a lot of people are vulnerable in this economy is that they’re too damned decent. Between, say, Tyler Cowen and Leo Durocher, who do you think has a better handle on how the world really works? Might The Rush To War With Iran Slow Down After Friday? Maybe. The reason is that Iran is having parliamentary elections this Friday, something barely noticed in most US media. This means that just as with our GOP candidates (all but one of them anyway) competing to see who can be more hawkish and promising war against Iran, so the Iranian political leaders have been hyping their standing up to the US and Israel and the various threats that have been made with various assertions and threats of their own, most prominently the one to close the Strait of Hormuz to oil exports, even though this would largely cut off their own exports, a seemingly completely irrational thing to do. As it is, given that their election oversight bodies have ruled out almost all seriously anti-governmentment candidates from running, not much is going to come of this election, and reportedly the disaffected in urban areas are not likely to turn out to vote much, although not particularly in response to calls by some outside dissident groups to boycott the election. As it is, with this sort of apathy by those who would like a more secular regime, the election is largely between competing hardline theocrats who are playing an Iranian version of what the US GOP candidates are doing (that is, all but one of them), making as loud and aggressive noises as they can to out-Islamistize each other. In any case, there is reason to believe that the rhetoric on the Iranian side may cool off somewhat after the election this Friday is over. There might even be some openings to talks. Maybe some slowdown of the rate of enriching uranium to 19.5% would do it (95% is what is needed for nuke bombs, and none is being enriched to that level). The latest hysterical reports had to do with their accelerating these activities beyond what is needed for their medical research reactor, and this has led some to speculate that their accelerated activity was being done precisely to pile it up in anticipation of talks that would lead to them cutting back on this activity. We shall see, but there may be hope for some cooling off, with an accompanying reduction of pressure on oil prices. Toledo, Ohio, where I reside, is an old Rust Belt city with bragging rights over very little. Two exceptions are: this is the city that produced the greatest jazz pianist - hell the greatest pianist - who ever lived, Art Tatum. And we have been represented in Congress for ages by one of the best, Marci Kaptur. But the Republicans in the state-house have redrawn Kaptur's 9th district to make it run in a thin line from Toledo to Cleveland - some 150 miles - along the edge of Lake Erie, encroaching on Dennis Kucinich's old district and forcing the two into an elimination match in the Democratic primary. For me, this is no contest: Marci is much the better choice. I hope she prevails. A nominal price increase over one year doesn’t sound that convincing. How hard would it have been to present matters adjusted for inflation? Dean presents a graph that takes the increase in owner equivalent rent over the 1991 to current period. It appears that there was no nominal increase in the previous year. Compare this to the 2.9% increase in the consumer price index over the past 12 months and the 1.6% increase over the previous year and a some elementary arithmetic indicates real rents have fallen over the past couple of years. And yet the Times claims that rents have been rising due to some alleged shortage? We disagree with Romney on a point vital to Michigan — his opposition to the bailout of the domestic automobile industry. Romney advocated for a more traditional bankruptcy process, while we believe the bridge loans provided by the federal government in the fall of 2008 were absolutely essential to the survival of General Motors Corp. and Chrysler Corp. The issue isn't a differentiator in the GOP primary, since the entire field opposed the rescue effort. Of course, this paragraph was omitted in the version of the op-ed that the Romney camp distributed. Too bad as the rest of the op-ed was the kind of GOP spin we’ve come to expect including a claim that Bain Capital was all about job creation and a clever way of making a virtue of how the architect of RomneyCare contradicts himself as he condemns ObamaCare. But it is its praise for austerity as an alleged cure of our unemployment problem that is the most laughable aspect of this silly op-ed. Romney knows how government policies affect private sector decision making. He understands the consequences of actions that raise business costs. And he gets that business is not the problem in America — a bloated and wasteful government is. He knows how to encourage the former and deflate the latter. Romney has been criticized by his opponents for downsizing troubled companies and firing workers. He acknowledges that those are often wrenching decisions. But if America is to avoid financial catastrophe, the next president must be willing to downsize government, jettison some of its operations and slash a federal work force that has grown by 12 percent over the past four years. Romney is best equipped for that task. Our graph shows employment by the Federal, state, and local governments from January 2007 to January 2012 hoping to make a few points. One is simply that the Federal government is not the only government employer. Local and state government employment was over 87% of total government employment as of January 2012. Mark Thoma provides us with What’s Wrong With This Picture showing how local and state government employment has been declining over the past few years. 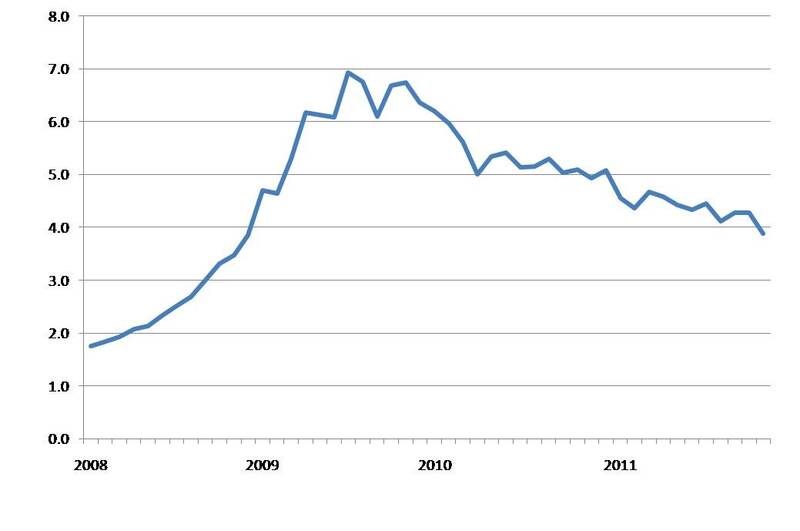 The other thing about our graph is I don’t see this alleged explosion in Federal employment. It is true that employment by all sectors of the government was rising in 2007 (before the recession) and continued to rise a bit in 2008 (before Obama became President). But over the past four years, Federal employment has risen by only 3.4%. If one looks at the last three years, Federal employment has increased only 1.4%. Over this same three year period, total government employment has declined by 2.7 percent. And Riding to the Defense of Developing Country Airline Companies Is…..
Martin Khor has made a career of fashioning progressive arguments in favor of developing country business interests. His latest tack is to denounce the intention of the EU to charge a carbon tax on flights to European airports. It’s a violation of national sovereignty, he says, practically a reimposition of colonialism. It forces people in the poor countries to pay for a problem that was caused by the rich. It will be much too expensive. Such an awful idea. One complaint in particular struck me: the EU has no business imposing a carbon tax on flights over non-EU airspace. Presumably the solution is to monitor the flight path of each plane and prorate the tax on the basis of its route. Planes will be zigzagging to avoid the surcharge, of course, and who knows how international airspace will or won’t be treated. I would be the last person to defend the halting, timid and largely captured EU carbon regime; nevertheless more carbon pricing in this and other spheres is surely better than less. I would ask those inclined to give Khor the benefit of the doubt to consider two propositions. First, not taxing carbon is subsidizing it, since the costs it imposes on current and future generations, not least the poorest and most vulnerable of us, is real. Second, in the absence of a strict global agreement, meaningful action against climate change is necessarily national and regional, and no jurisdiction will step forward unless measures are taken that neutralize the advantages that foreign businesses have if they are free from carbon constraints. If Khor is really concerned about the well-being of people in the bottom billions, he should raise questions about where the carbon money is going, and who benefits from free permit allocations and dodgy offsets. Noah Smith has an excellent post on the political biases baked into conventional macroeconomic models, especially DSGE. His view that the principal source of bias comes from the assumptions needed to make the models tractable accords with my take on microeconomics, particularly the ideological significance of convenient second-order conditions. I think we agree that these assumptions are not made out of explicit political motivation, but simply because they make life easier. Still, the bottom line is the same: bias is bias. Perhaps where the politics comes in is in the inclination not to worry about it. Juan Cole is listing 10 reasons why the US sanctions against Iran making money from exporting oil are not working at http://www.juancole.com/2012/02/top-ten-ways-iran-defying-us-oil-sanctions-and-how-you-are-paying-for-it-all.html . While indeed Iranian oil sales have fallen, the impact of this has been at least partly offset by the rising price of oil due to all the war talk associated with the sanctions, along with the failure of Saudi oil production to increase to fill the cutbacks, along with declines in oil production in Nigeria, Syria, and Sudan for various reasons, as well as the decisions by India, China, Japan, South Korea, and others to repudiate the US policy. All of this threatens Obama's reelection as gas prices are heading up and Republicans are claiming it is due to Obama blocking the Keystone pipeline project, even as they call for an even more hawkish policy against Iran (see Jim Hamilton for the latest analysis of the Keystone project at http://www.econbrowser.com/archives/2012/02/workarounds_for.html ). I largely agree with Cole on most of his points, with some minor variations. He argues that it is the "Israeli lobby," particularly AIPAC, that is responsible for the sanctions policy, although I would think that the lobby is responding to the Israeli government rather than being an independent source for this policy push. Israeli political leaders are fearful of a possible Iranian nuclear bomb, and according to the NY Times today, are probably not able to actually bomb out fully the four sites involved in the Iranian nuclear program, which may be why they are pushing even harder on the US, despite Israeli military intel reportedly agreeing with US intel and DOD that Iran does not have an active nuclear weapons program. The US and UK have reportedly urged Israel not to bomb Iran as this would be "destabilizing." They may not do so for the reason noted in the previous paragraph, but it strikes me that Netanyahu may not mind encouraging destabilization by engaging in war talk and pushing the sanctions that have Iran engaging in talk of blocking the Strait of Hormuz. Bibi does not like Obama and would be perfectly happy to see him lose an election due to a bad economy driven by high oil prices, and all that applause he got in the US Congress may make him think he can get away with this, and he probably can, although maybe the economic recovery is just too strong to be overcome by the negative effect of rising oil prices. I note some caveats on Juan Cole's post. He says that "Iran is sitting pretty." Not so. While oil prices have indeed gone up with all the war talk, the Iranian rial has declined by something like 60% against the USD. This is not helping the standard of living in Iran for people used to relying on imports of many consumer goods. OTOH, this decline in living standards, hoped by the US to put pressure on the Iranian regime, is backfiring, just as the economic embargo against Cuba has for a full half century now. Reportedly Iranian citizens are rallying to support the regime against the US actions against their economy. This fits in with another delusion pandered about in Washington, that we could get Iran to "stop its nuclear weapons program" by more vigorously supporting the Green movement opposition. First of all, any action to openly support the opposition would simply discredit that movement. Second, the opposition has long made it clear that it supports the peaceful civilian nuclear program of Iran. Getting them into power might make Israel slightly less paranoid, but it will not alter the nuclear program itself one bit. The key to the nuclear program remains as it has been for a long time, the position of Supreme Leader Ali Khamene'i, although an article yesterday in WaPo by Ray Takeh [sp?] argues that there is a new "war generation" led by Ahmadinejad that wants nuke weapons. It is true that these young guys will outlive him and could move the existing program into one that does lead to nuclear weapons, but he has repeatedly issued fatwas against nuclear weapons, and as Juan Cole has pointed out repeatedly, Iran has not attacked another nation since the 1700s. These minor facts, supported by official US intel reports, somehow get lost in all the hysteria and pushing of economically damaging sanctions programs. To the extent these sanctions programs are being put into place to keep the Israelis from bombing Iran, the report today in the NY Times may have removed even that half-baked rationale for this stupidity. A pattern I find disturbing is that much of the left, at least in the English-speaking world, regards economics simply as a source of intellectual and moral corruption. Those who take this view make sweeping pronouncements on economic topics, but they pride themselves in not polluting their understanding by consulting economists or reading what economists have written. Want an example? Check out the Uneconomics initiative and its “exposé” of how banks create money. Who could have imagined: private banks actually create money out of thin air when they make loans, and this creates the potential for economic volatility due to over- and undersupply. These secrets, supposedly covered up by sneaky economists and other elitists, are revealed by radical social critics, and we should be shocked, shocked. Banking is a system that runs on make-believe and survives on ignorance. Does it matter that a significant swath of the left thinks that standard stuff in a money and banking course is a great discovery that will shake capitalism to its foundations? And if I complain, am I just defending my own privileges as a so-called expert? Funny, I thought the reason to spend years of my life learning an intellectual speciality was to be able to make a contribution. Sorry about that. Barry Schwartz argues in this morning’s New York Times that capitalism is all about efficiency, and the problem is that too much efficiency can be a bad thing. A more profitable company, he says, is a more efficient one, and capitalists are right to pursue profit, but maybe we should slow them down a bit—add some friction to the process. I am reminded of the students I have every year, and there are a lot of them, who just can’t accept the idea that “equilibrium” in a market does not necessarily imply “good”. You can have equilibrium in a market for slaves, or for nuclear weapons, or simply for your ordinary neighborhood drone. How markets work and whether we are better off because they work that way are two entirely different questions. It is distressing that Schwartz can muse on the implications of the financial crisis for his notion of profit-seeking but never consider the concept of risk. Higher profit purchased at greater risk is not always such a great bargain, especially in a world of limited liability, not to mention bailouts of the systemically hyperconnected. How did it come to be that conventional wisdom, which was once skeptical of profit—maybe even too skeptical—has now embraced the assumption that more profit means more better? The time tradeoff (TTO) method is popular in medical decision making for valuing health states. We use it to elicit economists’ preferences for publishing in top economic journals and living without limbs. The economists value the journals highly, and have a clear preference between them, with American Economic Review (AER) the most preferred. Their responses imply they would sacrifice more than half a thumb for publishing in AER. Two words of caution, however. 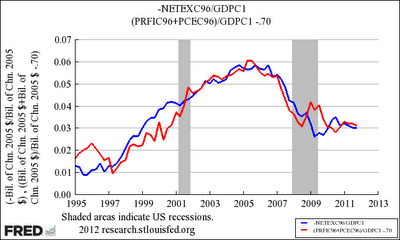 First, the trade balance in this graph is net, while residential consumption is gross. In reality, the capital inflows that financed our trade deficit were apportioned between housing and other loci of borrowing. Second and far more important, it is dubious to assume, with Smith (and Bernanke and Obstfeld), that the primary direction of causality was from differential savings propensities (low in the US, high in China) to trade imbalances, when it was the other way around. As far as I know, no one has ever rebutted the argument I made in Challenge five years ago. If it’s right, trade is primary. So, Mark Thoma has Tim Duy on again, http://economistsview.typepad.com/economistsview/2012/02/fed-watch-again-with-potential-output.html , with Krugman chiming in with his semi-goofy "Duy on Bullard on Duy on Bullard on Tinker to Evers to Chance." I agree with Duy that Bullard understates the various ways that the bubble crash messed up the financial system, but I want to note the link between this debate and an older one that we have heard less of lately. Some of the links are curious. In particular, although he avoids the language of those debates, I see Bullard in effect supporting views of people who disagree with the old conventional consensus, although in this he may have been following Alan Greenspan as well as Jamie Galbraith circa 1996 analytically, even if not in terms of policy. So, Arthur Okun coined the idea of NAIRU, which arguably was linked to the old textbook Keynesian story of a clearly defined potential output, with AS curves flat out to that level of output and then suddenly going vertical, in contrast to the one described by Keynes in the GT chapter on prices that had bottlenecks setting in well before then and "reducing elasticity" as one approached the "classical" zone where that elasticity went to zero. While I have never seen a coherent argument why NAIRU should coincide with this, when Milton Friedman posed the idea of the natural rate of unemployment, which simply swept the profession, most observers tied the NAIRU level of output to the level of output associated with Friedman's natural rate of unemployment, a level of output the economy supposedly goes to if there are no particular shocks and policy is more or less neutral, presumably an equilibrium level of frictional unemployment, hence only voluntary. Some would go further and link this with the old Wicksellian (picked up by some of the Austrians) natural rate of interest as well holding, a nice across the board general equilibrium level of output that could be identified in some sense with the supposedly clearly defined potential output of the old Keynesian textbook stories. But then a funny thing happened on the way to Broadway, namely the mid-to-late 90s. As unemployment fell through what many thought was its natural rate and no acceleration of inflation appeared, indeed the opposite happened, Greenspan sent his minions to the basement of the Fed and decided that productivity was improving sufficiently rapidly that we did not need to tighten monetary policy to avoid crashing into NAIRU. While this did not fundamentally upend the concept, it coincided with critiques coming from people such as Galbraith who argued that the concept was profoundly flawed and fundamentally useless. And Greenspan's continued loosening of policy without any inflation happening burnished his image. Indeed, from the very beginning of the natural rate discussion there had been people such as Phelps and later Summers who annoyingly pointed out the substantial endogeneity of the natural rate to past unemployment, how long spells of unemployment can make it harder for people to operate in the labor market, something that we are hearing again as voices are now being raised to claim that the natural rate has gone back up, although it remains unclear that if output were to rise sufficiently to push unemployment below that rate we would see an acceleration of inflation. Now, Bullard's position on this seems to have two contradictory parts. On the one hand, while eschewing the language, he seems to recognize the very weakness and fuzziness of the whole natural rate/NAIRU argument. This is an implication of his valid arguments regarding the fuzziness of the concept of potential output. As with Friedman, it is supposed to be the outcome of a general equilibrium of the economy. However, what the general equilibrium is or should be depends on a bunch of things such as the number of effective sectors in the economy and the degree of price stickiness, and so on. It is not well-defined, implying that these other concepts are also not well defined. OTOH, it sort of appears that he is using this fuzziness, along with the legitimate concern that potential output, however measured or defined, will be growing at a lower rate due to the outcome of the bubble crash (for my part due to reduced capital investment, even if that is not his argument), that then we may need to worry about crashing up against it and should avoid doing so just in case it might also turn out to be NAIRU, despite the lack of any apparent inflationary pressure in the economy, not to mention still low levels of employment relative to working age population and substantial measured excess capacity of the capital stock. For my part, to the extent the problem is indeed ultimately one of insufficient aggregate demand holding down real capital investment and thus the growth of the natural rate of unemployment output/potential output, etc., then the answer is most certainly not to tighten up any time soon on the macro policy levers, unless somehow Bullard is one of those folks who thinks that AD might actually be stimulated by higher interest rates. But I have not seen him claim that and doubt that this is what he is advocating. Is Bullard Rejecting the Bush Boom? I think it is plausible that such a line would be lower than the CBO potential line in Irwin's picture, and thus that the current output gap even by a production function metric would be smaller than the one in the picture. Bullard essentially claimed that before the latest recession we were already beyond potential GDP. Now I’m not buying this argument and I applaud The Money Illusion for an excellent discussion that I wish I had penned. Now admitting that estimating potential GDP is hard but also admitting that no one of us necessarily has a better series than the one put forth by CBO, I decided to look at the annualized growth rates in potential output implied by their series by decade. For the 1950’s we had 3.68% growth per year with the growth rate for the 1960’s being 4.2%. And yes growth in the 1970’s slowed to 3.25%. Of course, the Reagan years changed all that and we had potential GDP growing at a 3.03% per year in the 1980’s. Oh wait – I thought there was supposed to be some supply-side miracle. For those roaring 1990’s, CBO is claiming that potential GDP grew by 3.15% per year. But to my main point – the CBO estimates of potential output suggest annualized growth of only 2.36% during the alleged Bush boom. And Mr. Bullard thinks CBO was overestimating potential GDP? And the Republican recipe for faster GDP growth is a return to the policies of Reagan and George, Jr.? OK! 1. At times the perspective of the book flirts with nominalism. It seems to claim that only bottom-up perspectives and actions can meaningfully change the world: the search for a better “health policy” may be a chimera, for instance, while there is much we can do to improve the performance of this particular clinic in this region. My guess is that the authors would not go this far and would say that they are simply redressing an imbalance—that previous analysts of health and other policies were too prone to make sweeping judgments at an altitude too far above ground level, and that it is time to become more fine-grained. Fine, but I would like them to say this more clearly. To put it a bit differently, interventions are needed at all levels, from the village (or even lower) to the international, and in an ideal world our experiences in each would inform how we go about the others. To continue the example, just as national health policies should reflect what one has learned from the close study of a particular clinic, one would go about health policy at the village level differently depending on decisions taken higher up (for instance regarding what kinds of investments to make in training health professionals). Maybe this wider view will show up in their next book. 2. The book works best in the later chapters that are more traditionally “economic”, such as those on insurance and credit; the early chapters are less successful. The reason is not hard to find: the authors are rather narrowly trained as economists, and they do not cite much literature outside their own field. An instructive example is their misuse of the term “iron law of oligarchy”, which dates to Michels’ study of the organizational structure of syndicalism. It is not nitpicking to point this out: Michels is one of the canonical texts in the field of political sociology, and almost every sociologist knows his theory. Inadvertently, B&D are telling us they do not have a background in social theory. Of course, everyone cannot know everything, and we need a division of labor in the study of poverty, just as in any other domain. But economists should know their limitations going in and make an effort to at least acquaint themselves with the thinking of other specialists on the topics they are studying. The chapters on education and health, for instance, would have been much stronger if there were more attention given to what education and public health analysts have been saying and doing. 3. Even within economics the authors are rather narrow. This is striking, because their spirit and instincts are generous, even though their analytical toolkit is not. One telling example which runs through the entire book is their depiction of the “poverty trap”. They present it as the hypothesis that there are increasing returns to some kinds of investment, so that at low levels of investment there is insufficient incentive to invest more. This is good as far as it goes, but it doesn’t acknowledge other mechanisms. If you think about a poverty trap as a kind of multiple equilibrium, you would expect three different varieties. There are two kinds of static multiple equilibrium processes, increasing returns (the B&D hypothesis) and interaction (sufficiently strong cross-effects between the elements of an interactive system). In addition, there is a third, dynamic basis, adjustment processes that alter the initial conditions (hysterisis). The first of these, the B&D version, is the most widely “approved” within the economics profession; the third has made inroads beginning with the Sonnenschein-Debreu-Mantel intervention of the 1970s and the subsequent equilibrium unemployment literature, but is still on the margins; the second remains utterly heretical and is confined to cranks and misfits like me. How does this translate to poverty? Hysterisis is about how the coping mechanisms of poor people, which may be necessary to alleviate the worst effects of their situation, can also reinforce their situation. Fatalism as a psychological strategy illustrates this. Interactive traps would be those in which multiple economic, social and political factors combine to entrap individuals in poverty and are mutually reinforcing, so that it is not possible to make progress on any one front alone. These are not idle speculations. 4. The authors are self-aware culturally but not politically-economically. They are refreshingly honest about their preconceptions as outsiders from a much more prosperous background, and their learning process is one of the main themes of the book. At the same time, there is no discussion at all about where their funding comes from, why some projects are funded and not others, who funds their local partners and why, etc. This is important not only because there really are competing agendas in the world of development research and policy (surprise), but also because their approach is expensive. 5. Although B&D don’t seem to recognize it, their core recommendation regarding policy, that it be based on careful, ongoing assessment of outcomes, adheres to one of the major practitioner traditions of recent decades. Its roots go back at least as far as Dewey’s “intelligent action”; another theoretical foundation is cybernetic theory, e.g. Stafford Beer. (Schön’s reflective practitioner is not far from this either.) The idea is that effective management requires a feedback loop incorporating information-gathering, analysis and plan revision, one that is built in from the beginning and operates continuously. The idea has really taken hold in the “adaptive management” of natural resources, for instance in ecological restoration. Academic readers of this blog may be familiar with it through the emphasis on assessment in effective teaching. (You design your classes so that you get a continuous stream of information, in real time, on how students are learning, and you adjust your methods and content accordingly.) I think the book would have benefitted enormously by making the connection between poverty policy and broader perspectives in management and the professions. The recent debate between Bullard, Smith, Duy, our own Barkley Rosser, Krugman and others has been interesting and has caused me to reconsidered some of what I thought I knew on this topic. In fact, this is the fourth time I have sat down to write a post; my first three are all deleted. What I now think is this: the purpose of a potential output measure is to offer guidance to macropolicy. Bluntly put, a sizeable output gap tells us we can and should use monetary and fiscal measures to boost demand; an output surplus tells us to cool it. This is loosely associated with a notion of productive potential, in the sense that, as an economy approaches or exceeds this potential, extra demand is increasingly diverted into either price level increases, trade deficits or both. In this sense, what we want from an estimate of potential GDP is that it performs adequately as a guide to demand management. That said, is there a case that the collapse of the housing bubble in the last decade could lower the trajectory of potential GDP? The answer, I think, is yes, possibly. The reason is that potential output can well be altered by changes in the pattern of demand. The extreme poster child for this is Eastern Europe post-1989: they had a capital stock poorly suited to producing internationally competitive goods, and the sudden opening of their economies precipitated a change in demand resulting in a collapse in potential output. This is why their transitional slumps could not be cured solely by augmenting aggregate demand, for instance through fiscal deficits; the result would have been only some mix of more inflation and more trade deficits. The deflation of the housing bubble may have revealed a similar mechanism. Perhaps the mix of physical and human capital in our society was tilted toward a product mix (lots of suburban tract development) that will change under the new, post-bubble demand regime. It is true that unemployment in construction is not elevated over that in other sectors, but that doesn’t answer the question of what level sectoral employment will rise to once aggregate demand shortfalls dissipate. For this story to be statistically meaningful, however, two things need to be true. First, the change in the pattern of demand has to be substantial and persistent: Americans must continue to demand less new housing for the foreseeable future. This is not the same as saying, as Bullard has, that prices cannot resume their previous trajectory. (We can experience a change in the price-quantity relationship.) Second, our capital (physical and human) allocated to housing has to be on the clay rather than putty side of things, not just instantaneously, but over the span of many years. Putting it this way makes the issue empirical. You can embed these questions in various models (Solow, DSGE, your home brew), but whether the deflation of the housing bubble has caused a trajectory shift will come down to these two judgments. Someone should look into this. I’ve just finished reading this classic Finnish trilogy by Väinö Linna. It’s many things at once, a well-told story of three generations in a small village, a panorama of twentieth century Finnish history, and a Tolstoyan meditation on the themes of individual character, political principles and the gap between what we strive for and what our lives ultimately mean. Volume II, The Uprising, is the most powerful of the three. Its account of the socialist revolution of 1918 and the massacre that followed its suppression will be difficult to forget. Much of its force, however, comes from the careful development of its human context in volume I; each individual sent before the firing squad is vivid, someone the reader knows and cares about. The final volume, Reconciliation, is less effective, perhaps because, covering more decades in the same number of pages, it sacrifices depth. None of the victims of the wars against Russia are really developed personalities (except for the first to die, whose portrait is an elaborate exercise in irony). Even so, the account of the rise of fascism in Finland is detailed enough to permit comparisons to fascist movements in other times and places. Under the North Star is gripping reading, but it is also a work of ideas. It belongs on the shelf devoted to sagas of development, where the transformation from traditional to modern society—economic, political and cultural revolution—is lived by people whose frame of reference is the past, and who cannot begin to imagine where the future will take them. Noah Smith tells his economics job market story over at Noahpinion, and it inspires me to tell one of mine. (Bravo, Noah, not just for landing a good job, but for doing it nonrobotically.) I have a lot of stories, because I was on the market a long, long time. In this case, the time was December 1987, the place was Chicago, site of the annual economics meetings that year. I had just completed my dissertation, a theoretical treatment of wage compensation for dangerous work. (My chair was Herb Gintis, an extraordinarily generous and helpful advisor.) I had sent out a whole slew of applications but had landed hardly any first interviews. My plane landed in Chicago just as a powerful snowstorm was blanketing the city. Since O’Hare closed for a while, the beginning of the meetings was disrupted, and the entire event felt a bit surreal. I had some extra time the first morning—OK, with few interviews I had a lot of extra time all the way through—so I decided to get some exercise. My hotel’s fitness room was shut down for renovations, and they were giving away vouchers for a health club down the street. I went down to the concierge desk to pick up mine. Standing next to me was a woman of about my age, also picking up a voucher. Since neither of us quite knew where we were going, and the snow was blowing furiously in the wind, we decided to find our way together. I asked where she was from; she said the Duke school of public policy, and she was at the meetings to recruit. Amazing, I said, since I’m on the market, and I had applied to Duke public policy, and I was sure I would get an interview, since I am really a policy person, but I didn’t. Well, that was that: no last minute possibility at Duke. And it went downhill for the next half-dozen years, desperate and unproductive job-hunting with a smattering of amusing stories along the way. Mark Thoma at economists view has provided a reply by James Bullard, President of the St. Louis Fed, to Tim Duy's commentary on his speech at the Union League Club in Chicago on how he thinks that the housing bubble collapse could have reduced the growth of potential output, along with his criticisms of the standard public projections of potential output, http://economistsview.typepad.com/economistsview/2012/02/james-bullard-responds-to-tim-duy.html . I would like to comment on this given the nearly universal perception (including posts here by several folks) that Bullard does not seem to understand that the projections are based on the Solow growth model, particularly given that Bullard is one of the more open-minded and knowledgeable figures involved in decisionmaking at the Fed. What is going on here? To get at this one needs to read the links Bullard provides, most notably the 2009 paper by Basu and Fernald published by the St. Louis Fed on potential output. He notes that they argue that there are competing definitions of potential output. One is essentially long run growth, which should be tied to a growth model of some sort. The other is a shorter run one that they argue should be the equilibrium of a flexible price New Keynesian DSGE model. They argue that rather than the standard one-sector Solow model, what fits the data better is a two-sector model that focuses on technological change the capital goods sector (although they do a lot of handwaving about aggregate Frisch labor elasticities). In effect, they offer four different alternatives within the short-run case: one-sector vs two-sector and flexible price versus sticky prices models, ultimately supporting the two-sector-flexible price one. This plethora of choices lies behind Bullard's unhappiness with most projections of potential output. OK, so let us grant that there is a lot of fuzziness with regard to what the proper projection of potential output is from this perspective. But does this translate to a reasonable argument that the potential may be a lot lower than the standard one-sector Solow model projection in the recent period due to the bubble and its collapse? This seems to boil down to the claim that the projections most are using amount to being based on unsustainable growth rates based on the bubble period. Well, maybe, although Basu and Fernald do not directly address this, nor do they offer how to estimate how potential output calculations should be made to overcome this problem. As it is, I think there is a case to be made that the collapse of the bubble did reduce the growth of potential output, by most methods of estimation. I note that I do not see Bullard making the argument I am making specifically or explicitly in either his original talk or in his reply to Tim Duy, but perhaps it or some variation of it was lying behind his arguments. The basis of this argument is that the fall in output following the collapse of the bubble has reduced the rate of real capital investment. Of course, the sharpest decline was in the real estate construction sector, the part of the economy that was most severely distorted by the housing bubble, and we should expect that part of investment to remain reduced for some time. However, it is not clear that reducing this will damage the productivity of investment in factories, machinery, and equipment, which is the real core of the growth of capital stock that increases potential output. Nevertheless, the sharp reduction of aggregate demand has almost certainly reduced the rate of this sort of potential-output-increasing investment. So, the massive and sustained reduction of aggregate demand following the collapse of the housing bubble and its impact on the financial sector, has reduced the growth of factories, machinery, and equipment, which in turn has reduced the growth rate of potential output below what it would have been if the housing bubble had been ended without all the unpleasant impacts on aggregate demand that accompanied it (beyond the reduction in demand for housing construction). I do not know if this is what Bullard was trying to get at in his various attempted explanations of what he has said, but I think that it is a more or less coherent story that does fit with his general argument. Like many of you, I have had a queasy feeling about the loss of privacy in the digital era. Every online transaction and communication is out there for monitoring, profiling, packaging and retailing, and no promise by a company or government is going to change this. The commercial implications are troubling enough, but what about the future? What happens when a really bad government comes along and uses this information for outright repression? Well, the future is now. Read this chilling report on the use of new surveillance technologies to control what you can read about such matters as state-sponsored torture (the Kiriakou case) and corrupt insider contracts in the “war on terror” (Sterling). If it had been Obama and not Google that campaigned on the slogan “Don’t be evil”, we could accuse him of breaking a promise. So, basically, what we have here is Bullard saying that the neoclassical (Solow) growth model - and all models like it - are wrong. He's saying that a change in asset prices can cause a permanent change in the equilibrium capital/labor ratio. Estimates of potential GDP are not simple extrapolations of actual GDP from the peak of the last business cycles. They are estimates of the maximum sustainable output given fully employed resources. The backbone of the CBO's estimates is a Solow Growth model. So I don't think that Noah Smith is quite accurate ... Bullard can't be saying the Solow growth model is wrong because he doesn't realize that such a model is the basis for the estimates he is criticizing. I was curious as to how much difference this makes so I extrapolates 2007QIV real GDP by assuming growth equal to 0.5% per quarter for the next four years and compared the GDP gap predicted this Bullard approach (GAP*) to the GDP gap one would get using the CBO estimate for potential GDP. 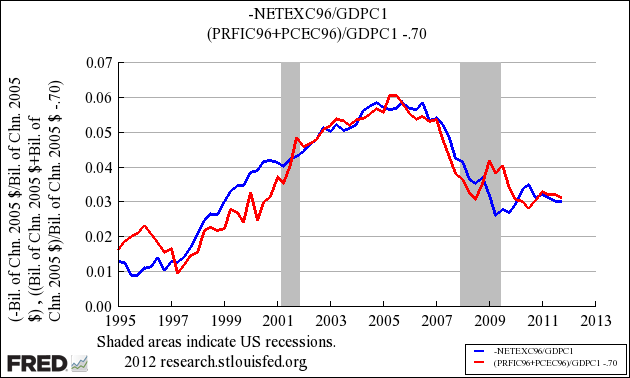 Either way – we are still far below full employment. After posting on this subject a few days ago, I’ve been raked over the coals in the conservative Blogosphere, principally in the Arnold Klingdom. I am accused of thinking I possess a “superior wisdom”, since I disagree with the majority of economists on this issue. I ignore “mountains of data” and base my agnosticism on sheer ignorance. I am really the worst of the worst. I could rest my case on a simple defense: my post was not about rent control, which I haven’t studied, but on the doctrinaire treatment of the topic by economic textbooks. Even if they’re ultimately right, they’re right for the wrong reasons, and that matters when the issue is how to use economics as a tool for thinking. But having had my curiosity piqued, I decided to do a quick literature search. Sure enough, there is a large literature out there. I glanced at a few models with their statistical implementations and formed a few reactions. I will spare you here, since it takes more than a couple of hours to know what’s what in a serious field of study. But I noticed that two review essays from the 1990's seem to hold pride of place. And Richard Arnott asked whether it is “Time for Revisionism on Rent Control?” in the Journal of Economic Perspectives in 1995; his answer was yes. But of course there was further work in the 00's, and no doubt the subject will look different a few years from now. The one conclusion I can draw at this point is that a sweeping condemnation of rent control derived from elementary supply and demand analysis (in a frictionless market with no externalities) isn’t a very good way to enter the debate. UPDATE: It's not enough to know the US experience with rent control. I've found out that Germany has had a national system of rent control for decades; it is widely seen as successful, and, as far as I know, no major party has proposed getting rid of it. Maybe German readers of this blog (all three of you?) will want to chime in. Once again, this proves nothing, but it does suggest that simplistic, doctrinaire judgments rendered by economics textbooks are not much to go on. This is not an argument for rent control; it's an argument against the textbooks. Higher interest rates, more business failures, sharper rises in unemployment, and potentially even a catastrophic loss of confidence and the end of the recovery ... An economy where the state does not take almost half of all our national income, crowding out private endeavour. The entirety of this speech reads like standard Republican fare with its call for cuts in government spending but no new taxes. To be fair, however, the advice given by the members of the Council of Economic Advisors to President Lyndon Johnson back in 1966 worried about higher interest rates and crowding-out. But the economy then was at full employment and the Federal Reserve was already raising interest rates to avoid demand pull inflation. We can’t blame Johnson’s Keynesian advisors for the lack of political will to adopt fiscal restraint when needed. The very first meeting I ever had with the President-Elect was on exactly this topic. I was in Chicago in mid-November 2008 for my job interview. The President-Elect began the discussion by saying that the economy was very sick and there was not much more the Fed could do—so we needed to use fiscal policy. The one thing that has disillusioned me is the discussion of fiscal policy. Policymakers and far too many economists seem to be arguing from ideology rather than evidence. As I have described this evening, the evidence is stronger than it has ever been that fiscal policy matters—that fiscal stimulus helps the economy add jobs, and that reducing the budget deficit lowers growth at least in the near term. And yet, this evidence does not seem to be getting through to the legislative process. That is unacceptable. We are never going to solve our problems if we can’t agree at least on the facts. Evidence-based policymaking is essential if we are ever going to triumph over this recession and deal with our long-run budget problems. I have posted on this previously, but want to provide a link and more detail. The link is old, to the 2011 Credit Suisse Yearbook, out a year ago, an article entitled "The quest for yield," by Elroy Dimson, Paul Marsh, and Mike Staunton, on pp. 15-23 of credit_suisse_global_investment_yearbook_2011.pdf . I note that so far there has not been a single academic publication on the gist of this paper, that over the last 20 years in 19 out of 21 countries, buying annually reconfigured high yield stock portfolios provided both higher returns and lower risk than alternative investment strategies. Needless to say, this is an anomaly that violates CAPM, the Efficient Market Hypothesis, and several other sacred cows of conventional financial economics theory. Of the 21 countries studied, the only ones where the "yield effect" was negative, higher yield portfolios underperformed lower yield ones on returns over 20 years, were New Zealand and Ireland, not exactly major markets. The yield effect was highest in Austria, France, and Japan. The more crucial matter is risk, given that standard portfolio theory dating from Markowitz, if not much earlier, is that risk and return are positively related, not negatively (although another violation has been the matter of home asset bias, where most would do better on both risk and return by internationally diversifying portfolios more than they do, although this has been known and much studied in the academic lit for a long time, unlike this matter). So in Figures 8 and 9 one finds the crucial findings, both across all countries and then broken down for them individually, comparing high yield, low yield, zero yield, and country index funds. For the varying yields, it is monotonic, with risk rising as yield declines using both standard deviation and beta, and also with the Sharpe ratio declining (return per extra unit of volatility) across the yields from high to zero. It is a closer call in comparing with the country index funds, which do better than the lower yield strategies on all of these. However, it is only on standard deviation that index beats high yield, but just barely, 21.4 to 22.6. High yield beats index on beta, 0.89 to 1.0, and simply tromps it on the Sharpe ratio, 0.42 to 0.30. So, how is this explained? Well, it is not likely it is chance, and while there might be some tax effect, the authors provide arguments why this is probably not the case or only minimally so at most. This leaves a behavioral explanation: people overbuy low yield growth stocks in bubbles that end up being more volatile because they crash so much harder. Looks pretty reasonable to me, but nobody in academic economics or finance is talking about this at all. As of 2009, a very bad year economically, the median hourly wage for drivers of delivery trucks was $13.84; for carpenter’s helpers, $12.63; for building cleaners, $13.37. That means $505 to $554 for a forty-hour week, or $25,260 to $27,680 for a fifty-week year. Those are not great incomes, but they are enough to be able to live a decent existence – almost twice the poverty level even if you are married and your wife doesn’t work. So why would you not work if a job opening landed in your lap? Why would you not work a full forty hours if the hours were available? Why not work more than forty hours? But this argument applies just as much to the rich as to the poor. And strange to say, you never do find conservatives arguing that we shouldn’t worry about higher tax rates on the rich, because they’ll just work harder to be able to afford those luxury goods; or that a higher inheritance tax probably expands work effort, because it would force the Paris Hiltons of this world to go out and get real jobs. Art Laffer wanted us to believe just the opposite – that higher tax rates would induce Paris Hilton to work less. In other words, the Laffer curve presumes a very strong substitution effect and a very weak income effect. I guess Charles Murray’s assertion here questions the underlying premise of the Laugher Curve! Quote: What was the true cause of western inflation in the 1970s? Enough has been said for now on the sins of commission in the Greek austerity program. (See Floyd Norris in today’s New York Times for an excellent dissection.) I’m interested in what has been left off the agenda. My starting premise is that the fundamental cause of Greece’s lack of competitiveness is not its wage level but its pervasive clientelism. The beef against the national railway, for instance, is not that workers were overpaid, but that jobs were dished out as payoffs without any regard for the country’s transportation needs. Taxes aren’t collected because tax sheltering is another payoff, in this case for the benefit of a higher income class. Cartels carve up markets, and regulators look the other way—more payoffs and more waste. One way to think about Greece is that it has the kind of economy Italy would have if it were all Mezzogiorno. Although the complexities and national distinctiveness of the Greek political economy cannot be capture by any single model, a reasonable first approximation would be that the country is in the grip of a deeply-entrenched system of clientelism that spans nominally public and private sectors. By clientelism, I mean a system in which patrons extend material benefits (jobs, tax shelters, monopolistic profits) to clients in return for offers of loyalty (votes, support in conflicts with other bigwigs, etc.). The theory of clientelism was the topic of a paper I presented at the ASSA meetings in Chicago. The troika has not directly targeted Greek clientelism, but what should we expect the unintended consequences of its demands to be for this de facto regime? For instance, if numerical targets are imposed that result in public sector layoffs, will this lessen the grip of clientelism or make it even stronger? Who controls which public sector jobs will be eliminated? If some of the jobs are “honest” and others “payoffs” (I realize the reality is not so dichotomous, but this is an attempt to jumpstart a thought process), how will layoffs be apportioned between them? If payoff jobs become more scarce, will they rise in value? Will patrons be able to extract even more loyalty from clients by offering favors in a depleted environment? If the minimum wages on which current payment formulas depend are cut by more than 20%, will the formulas themselves become more flexible, and therefore more susceptible to clientelistic manipulation? Who gets to decide this? Will an economy-wide salary freeze reduce clientelist discretion or displace more of it to the enforcement apparatus? As state capacity falls, will this increase the scope for clientelistic relations according to the principle that the disinterested rule of law is a principal alternative to clientelism, or will it reduce the exercise of clientelism within the public sector itself—or both? Will the state become more susceptible to the privatization of public goods (like public services) by officials using them to purchase personal loyalty? In other words, which state capacities are likely to decline fastest and furthest? Social scientists have become skilled at analyzing a wide range of institutions, such as markets, businesses, political parties and bureaucratic administration, but there has been no systematic investigation of clientelism corresponding to its status as one of the fundamental structures of social organization. As a result, important questions about the Greek economy and society are not even being asked, much less investigated. An over-reliance on slimming government budgets is feeding the euro zone’s recession, European Union Labor Commissioner Laszlo Andor warned in an interview. “We need a smarter fiscal consolidation than before, which means that the wrongly calibrated fiscal consolidation measures probably contributed to the deceleration of growth and this second dip,” the EU Commissioner for Employment, Social Affairs and Inclusion said after meetings with the Obama administration, International Monetary Fund and World Bank officials this week. Although the job of labor commissioner isn’t one of the heavyweight roles within the commission, Andor’s comments are one of the first times a top European Union official has publicly suggested that the broad focus on austerity has been harmful to the European economy. The commissioner said he spent much of his time in Washington studying how the U.S. was able to spur demand and cut persistently high unemployment levels. The U.S. government and the Federal Reserve have greater flexibility than the E.U. or the European Central Bank, a lesson he said that has application in Europe. It only shows how incredibly awful European aggregate demand policy has been when our anemic efforts to restore full employment are seen as a guide to their macroeconomic policies! The latest post by Jodie Beggs rehashing the standard story about rent control has me quietly steaming. It’s not her fault, of course: she is simply regurgitating what has become a mandatory morality tale, an unavoidable rite of passage in Econ 101. You know the drill: in their misguided desire to be fair to the poor, the authorities have set a ceiling on rents below the market-clearing price, and the result is excess demand in the short run and reduced supply in the long run. Now that you have mastered the supply and demand diagram, you are so much smarter than they are. I’m agnostic about rent control myself (it depends entirely on the context and the details), but for me this story is a poster child for the ideological rigidity of economics as it is taught to impressionable youth, not the superiority of “the economic way of thinking”. There are two huge holes in the textbook argument. The first is that it overlooks neighborhood effects—literally. The most compelling argument for rent control is neighborhood stabilization, the idea that social capital in an urban environment requires stable residence patterns. If prices are volatile, and this leads to a lot of residential turnover, the result can be a less desirable neighborhood for everyone. Thus the quality-adjusted supply curve is partly a function of price (or at least price stability in a dynamic model), and the S and D curves are not independent of each other. You’ll notice that not a single textbook treatment of rent control mentions stabilization as an objective, even though this is a standard element in the real-world rhetoric surrounding this issue. Again, I’m not taking a position, just saying that the representation you get at the introductory level is an ideological construct, not an honest analysis. The second hole is that rent control ordinances are normally replete with measures intended to maintain supply incentives, like price increases tied to investment in housing quality or simply spreading out increases over a longer time so tenants are able to adjust. Again, these measures may succeed or fail, but a simple horizontal line in a one-period S&D model doesn’t begin to address them. In fact, advocates for rent control have taken Econ 101 (most of them), but they just disagree on how large the positive and negative impacts are. The purpose of economics should be to help us think clearly about the matter—for instance by identifying the potential empirical data that could adjudicate between competing arguments—but in its textbook form it is a ritualistic way of curtailing thought. UPDATE: Standing in the shower, my mind drifted back to Orwell: "Free markets good! Price controls b-a-a-a-a-d!" If voters approve a new one-cent sales tax for transportation projects, it could be one of the greatest economic tools in Georgia, according to an official pitching the benefits of the proposal. “This is the best option on the table. Is it perfect? No. Is it the best thing going? Absolutely,” said Doug Callaway, executive director of the Georgia Transportation Alliance — a nonprofit group affiliated with the Georgia Chamber of Commerce. Come July 31, voters in 12 districts throughout the state will be asked to consider a 10-year, one-cent sales tax that will fund transportation projects in their region … Callaway outlined the key points of the T-SPLOST that voters will likely hear until they head to the polls this summer: More jobs, safer roads and revenue that stays in the region. “We’ve got high unemployment, let’s be honest, and little hope for an immediate turnaround,” Callaway said, while pointing to University of Georgia experts who estimate that the economy won’t improve until 2020.Those regions that approve the T-SPLOST stand to possibly create more immediate and long-term jobs — while recovering more quickly from the economic downturn, he explained. T-SPLOST stands for the Transportation Special Local Option Sales Tax. If a county decides to increase its sales tax by 1% for each of the next 10 years, then construction on new transportation projects can begin. Mr. Callaway is justifying this proposal on Keynesian grounds. While I hope Georgia’s economy can recovery before 2020, we have to admit the current recovery is going slowly. But, if we do build the bridge by taking tax money away from somebody else, and using that to pay the bridge builder -- the guys who work on the bridge -- then it's just a wash. It has no first-starter effect. There's no reason to expect any stimulation. And, in some sense, there's nothing to apply a multiplier to. (Laughs.) You apply a multiplier to the bridge builders, then you've got to apply the same multiplier with a minus sign to the people you taxed to build the bridge. And then taxing them later isn't going to help, we know that. If you spend X at time t to build a bridge, aggregate demand increases by X at time t. If you raise taxes by X at time t, consumers will smooth this effect over time, so their spending at time t will fall by much less than X. Put the two together and aggregate demand rises. If Mr. Callaway has his way, maybe we can have an empirical test along the lines that Christina Romer talked about! If the decline keeps to the trend it has established since the cyclical peak of 6.9 of July 2009, in another 18 months we’ll be back down to two workers looking for work for every job opening. This is still above the ratio most economists would prefer (about one-and-a-half to one), but it’s not bad. There is a big proviso, however: the unemployment numbers do not count the large number of workers who have apparently withdrawn from the (pathetic) labor market. And, of course, there is no guarantee at all that this trend will stay on course. Newt’s Objection to Romney’s Minimum Wage Proposal – Does Newt Know Alan Krueger and David Card? And Newt Gingrich, Romney's leading rival for the nomination, said Sunday on Meet the Press that "virtually every economist in the country believes that [indexing the minimum wage to inflation] further makes it difficult for young people to get a job." This story next reminds us of a study written by Alan Krueger and David Card, which challenged Newt’s ideology. Murray has a new book out, Coming Apart: The State of White America, 1960-2010, that argues that the top fifth of the (white) income distribution excels on merit and virtue, while the bottom 30% is mired in a dysfunctional, dead-end culture. Thus the income divide is just a symptom of the real cause, the widening virtue gap. It takes guts to go out on a limb like this, doesn’t it? Imagine trying to convince the upper middle class that they are morally superior: do you think he will be able to drum up any sales? This afternoon I discovered an interesting publication on the web entitled 'Tragedy and Hope - A History of the World in our Time'. It was published in 1966 by professor Carrol Quigley (an American historian and theorist of the evolution of civilizations) who taught at Georgetown University in the US in the 1960s and is reported to be a mentor for former US President Bill Clinton. In these times the truth of the above statement appears obvious. Cheap goods are definitely moving from low-priced areas in China and South East Asia (in particular) to fully-industrialised nations where they fetch a much higher price. Money, in the form of capital, has been flowing out of the rich western nations and moving to the 'low-priced areas' around the globe. The trouble is, that although Quigley's theory has the strong ring of truth to it, his theory contradicts the basic micro-economic theory of supply and demand. Foundational economic teachings have made it clear that it is the demand for individual goods that are impacted by price level, and that the price level is (largely) set by the level of consumer demand. However, Quigley writes about a wide range of goods in a particular geographic areas and not about any particular good. I assume, therefore, that Quigley is implying that international currency manipulation is a key part of the operations of the world capitalist system. A low value for domestic currency makes goods (and services) cheaper for international buyers, and vice versa. Capitalism's foundation therefore must rely on processes of unequal exchange where the 'price mechanism' for goods is largely determined by the relative value of the currency they are purchased in. "It is quite impossible to understand the history of the twentieth century without some understanding of the role played by money in domestic affairs and in foreign affairs, as well as the role played by bankers in economic life and in political life" is Quigley's understatement. Deregulation did not turn out to be 'no regulation' after all. It appears to have simply meant leaving the management of the world economy largely to the whims of a global and organised cartel of private banks (ie the central banks). "The power of the State must be invoked for restoring economic freedom just as it has been invoked for destroying economic freedom." Over here we have debate on the decades-long upsurge in inequality, fueled by the increasing share of income going to the top 1%. Over there we have the politics of forest prevention, specifically the push by the state of Colorado to weaken roadless protection in order, among other things, to try to suppress forest fires. What’s the connection? The main purpose of the roadless areas directive is to keep land available for wilderness designation. The guiding philosophy of wilderness is that large swaths of forest, desert and other ecosystems need to be left alone to provide the sort of habitat, recreation and research that can exist only in the absence of large-scale human interference. Keeping out roads is a way of putting a ceiling on that interference. One aspect of wilderness is permitting a natural fire ecology. Periodic fires are part of the system, so they should be allowed to burn off excess fuel and permit the rotation of tree species. (Fire-resistant species thrive in the wake of a fire but are eventually displaced by more susceptible competitors, until another fire begins the cycle again.) The expectation has been that more of these smaller fires will reduce the number of monster burns. It hasn’t worked out quite that way. One reason is climate change, which is slowly redrawing the ecological map of North America. Some land that used to be forest is destined to be savannah or even drier, and fire, abetted by disease, is often the agent of change. But something else has happened, much more rapidly: large numbers of the newly rich have chosen to build their second (or nth) homes in remote areas of Colorado, Wyoming, Montana and other mountain states. They like the magnificent vistas and opportunities for recreation provided by public lands, as long as they can own their own private chunk next door. Naturally, they have the means to fly back and forth, so distance is not a problem . But he [Glenn Casamassa, a US Forest Service supervisor] said the West, and maybe Colorado in particular, has also changed significantly in the intervening years. More people are living near national forests. An outbreak of pine-killing bark beetles that has its epicenter in Colorado and several major fires over those years that roared out to touch the edge of urban life have also changed thinking about intervention in the wild. And that’s how it is. If a proposed financial regulation runs afoul of the 1%, out it goes. If closing a tax loophole brings their rate up to everyone else’s, no go. And if wilderness gets in the way of their weekend getaways, then this requires “changed thinking” among forest managers. Would President Gingrich Hire Christina Romer as Economic Advisor? Newt Gingrich said Sunday that an “age of austerity” is the wrong solution for the economy and would “punish” the American people. He said he prefers “pro-growth” policies instead. The comments appear to pour cold water on the modern Republican belief that austerity and growth go hand in hand. I just wish we could take the latest from Newt seriously! The Chinese Question: Liquidity or Solvency? Once again the EU is trying to get China to commit a few hundred billion of its foreign exchange reserves to shoring up Eurozone sovereign debt. The European “stability” mechanisms (EFSM and ESM) need more money, and no one in Europe is willing to lay that much on the line. China says it would be willing to step in, but under one condition: that its investments are guaranteed. This is perfectly reasonable. China is still a largely poor country, and there is no reason why its people should risk losing their savings in order to help manage the affairs of much wealthier Europe. At the same time, however, their demand exposes the fundamental dishonesty of Eurozone policy. Except for Greece, the official line is that all sovereign debts will be honored and all fiscal targets met. The rescue facilities exist only to provide bridge loans that markets are unwilling to extend at a reasonable cost. With enough liquidity, austerity and reform, financial sustainability is assured. If this were really the case, however, there would be little risk in giving the Chinese the guarantee they demand. And no one seriously expects such a guarantee to be offered. The reason is that the true situation in the Eurozone bears little relation to the optimistic talk still issuing from summits like the one just concluded in Brussels. Greece is only the first in line; Portugal too will need debt relief and perhaps also Ireland. Spain faces an entire banking system that may well be technically insolvent, and it can neither survive a banking collapse nor come up with the funds to forestall one. All the severely indebted countries are at risk from the gathering recession, and the need for further recapitalization of the banks across the continent is a further risk. In the face of this frightening public and private debt overhang, the official policy has been to lend, lend and lend some more. The ECB has turned back the doomsday clock by lending half a trillion or so euros at close to zero interest to private banks in return for their own lending to overstretched sovereigns. So-called bailouts, like the next tranche at issue in Greece, are also loans. Politicians give stern speeches about how debt cannot be the solution to debt, and then they find more spigots for lending: beef up the European Financial Stability Mechanism, bring on a permanent mechanism, go door to door in China. But if the problem is not liquidity but solvency, this avalanche of credit is profoundly wrongheaded. The solution for insolvency is always the same: write down existing unpayable debts and generate income—transfers if necessary—to forestall new debts. In the current environment each is associated with an immense political-economic challenge, since the first requires confronting the European financial oligarchy and the second creating a true, zone-wide fiscal entity (the feared transfer union). Achieving either alone would be a miracle; accomplishing both is almost beyond utopia. At least we can thank the Chinese for clarifying the contradiction at the heart of the current policy charade. Every House Republican voted Thursday to reject the proposition that the Bush tax cuts added to the deficit. Joined by just a handful of Democrats, the full Republican conference rejected a measure that would have affirmed what nearly all budget experts and economists recognized: President George W. Bush's debt-financed tax cuts blew up the budget in the last decade, leaving the country in a hole that sank into a chasm after the 2008 financial crisis. The final tally was 174-244. I guess their next vote will declare that the Earth is flat.